Last week Steam switched over its pricing to make dollars, euros and pounds equivalent. As you might imagine, this hoses UK/EU customers, and they're not too happy about it. Sounds innocent enough, right? Nope. 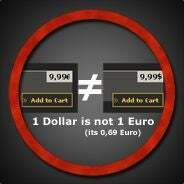 All currencies are equivalent for pricing purposes. So a $9.99 game costs €9.99 and £9.99. Quick check of the exchange rates shows that is, in US Dollars, $9.99, and $13.85 and $14.83, respectively. Put another way, Call of Duty 4, a $49.99 title, would be equivalent to $69.35 and, working backward, amounts to about a €14 difference, or an extra 25 percent that Valve (and the publisher) make on the exchange. A group has been set up on Steam to protest the difference. Sure, retail copies of games sold in Europe may not be pegged to their U.S. retail price. And fine, maybe there's a headache maintaining three different pricing structures. But the point is that Steam had been selling in U.S. dollars and European customers, no different than tourists buying physical goods, took advantage of the exchange rate. They're now hit with 25 percent markup. Don't expect them to suddenly accept your business argument.